Synchrotron radiation (SR) is an electro-magnetic wave emitted from an electron traveling at almost the speed of light, toward its running-direction when its path is bent by a magnetic field. Synchrotron radiation is characterized by useful features; brightness, high directionality and variable polarization. 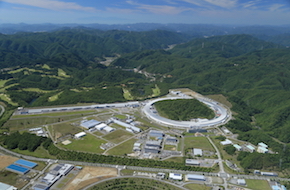 SPring-8, the world's largest third-generation synchrotron radiation facility, provides the most powerful synchrotron radiation currently available. SPring-8's ultra-brilliant synchrotron radiation gives researchers exciting opportunities for advanced research in materials science, spectroscopic analysis, earth science, life science, environmental science, industrial applications and so forth.